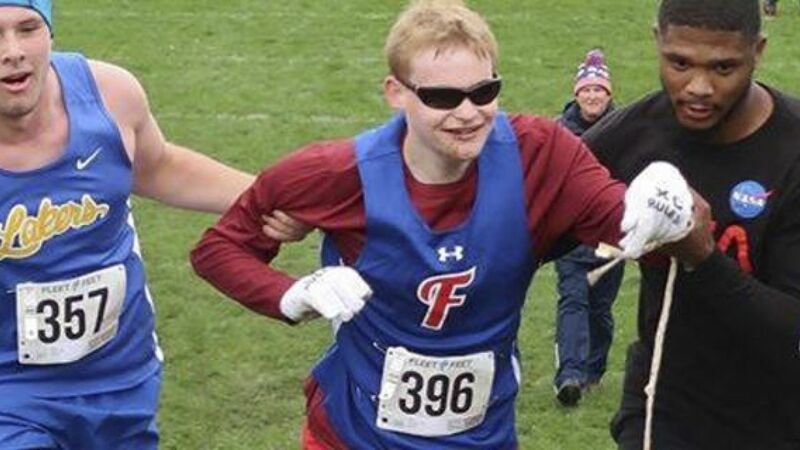 AUBURN, N.Y. – A New York high school cross-country athlete is being praised for stopping to help a vision-impaired runner who fell as they neared the finish line. Syracuse.com reports that Cazenovia High School sophomore Jake Tobin only had about 320 yards (290 meters) to go in the boys junior varsity race during Saturday’s race when Fairport High School senior Luke Fortner passed him. Fortner is legally blind. He slipped and fell on a hill. Tobin stopped, put his arms around Fortner and lifted him up as Jerry Thompson, the aide who accompanied Fortner during the race, also provided help. Fortner and Thompson crossed the finish line 2 seconds ahead of Tobin. Photos taken by a spectator show Tobin and the aide helping Fortner up the hill.